Ideal for floor-to-ceiling window spaces and slide door entries, our vertical blinds are the perfect solution for vast areas. Offering simple installation and an easy operating mechanism, the vertical blind is an incredibly versatile and user friendly product. 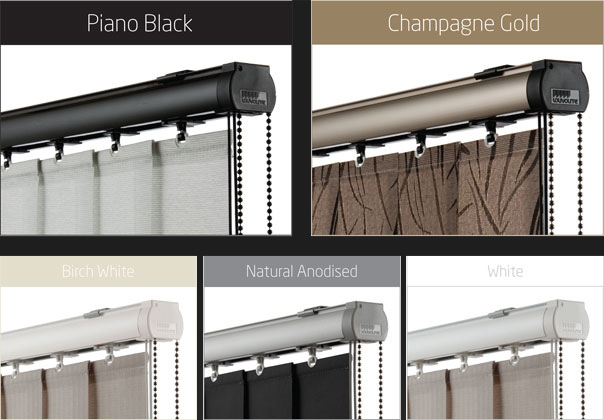 The vertical blind is available in either 89mm or 127mm slat widths, and is also available in many ranges and colours. NBS offers two kinds of Vertical track. NBS offering is the Louvolite track and the Deco Plus track from Turnils. All plastic components are 100% Virgin material – 100% UV stable. Available with cord and chain operation or wand for child safety. Works on friction and not wheels so a lot quiter when operating. Complete with 24 months warranty.